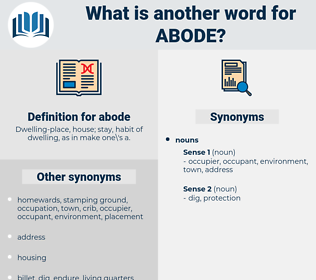 What is another word for abode? 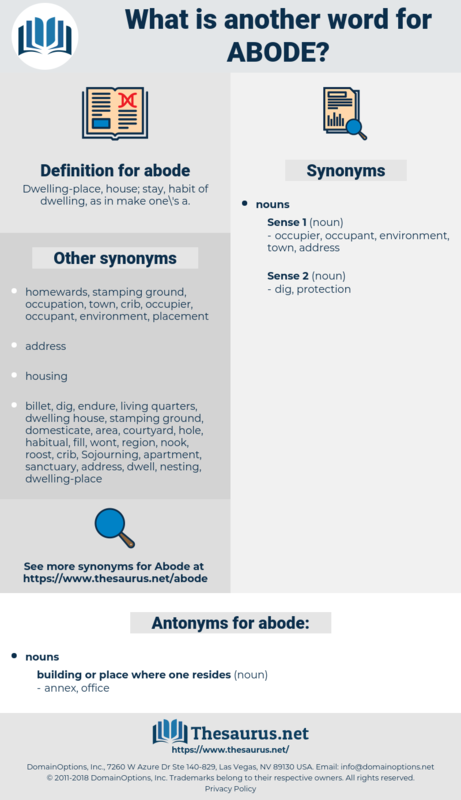 Dwelling-place, house; stay, habit of dwelling, as in make one\'s a.
domicile, residency, resident, shelter, ROA. Soon after this the works at the Bell Rock were resumed, with, if possible, greater vigour than before, and ere long the " house" was fixed to the top of the beacon, and the engineer and his men took up their abode there. But indeed, ever since taking up their abode at the cabin several weeks before, they had never passed a single day without guests. aptitude, abbot, abide, apatite, aft, a bit, avidity, apathy, appetite, aphididae, abaft, apidae, abwatt, apodidae, abet, abate, abut, avowed, apt, aviate, avid, aphidoidea, about, afoot, au fait, aphid, apoidea, avoid. legal residence, domicile, home, place.